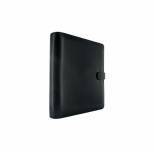 Filofax Finsbury A4 Black Organiser 025321 Pack of 1 Filofax Pimlico A4 Organiser. Classic grained leather organiser. Features include - credit card pockets, internal zip pocket and pen loop. Supplied complete with diary, name and address pages, A-Z and note pages. Paper Size: 210x297mm. Colour - Black. Filofax Raspberry Finsbury Personal Organiser 025371 Pack of 1 Filofax Finsbury Complete Personal Organiser with a soft leather printed cover, 6-ring 23mm mechanism, 6 vertical credit card pockets with full length zip pocket (left side), full length zip pocket, pen loop (right side). Colour - Raspberry. 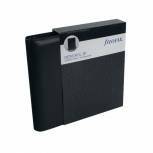 Filofax Black Finsbury Personal Organiser 025302 Pack of 1 Filofax Finsbury Personal Organiser. Traditional, grained leather organiser featuring three horizontal pockets, credit card pockets, full length zip pocket, exterior pocket and pen loop. Supplied complete. Sheet Size: 95x171mm. Colour - Black. Filofax Finsbury A5 Black Organiser 025368 Pack of 1 Filofax Finsbury A5 Organiser. Traditional, grained leather organiser featuring three horizontal pockets, credit card pockets, full length zip pocket, exterior pocket and pen loop. Supplied complete. Sheet Size: 148x210mm. Colour - Black. 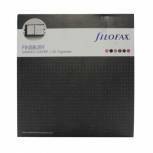 Filofax Metropol A5 Black Organiser 026968 Pack of 1 Filofax A5 Metropol Organiser. Understated, modern organiser with leather like vinyl cover, credit card pockets, full length pockets, pen holders and mesh notebook holder. Supplied complete with contents. Size - 148 x 210mm. Colour - Black. Filofax Metropol Zip-fastening A5 Black Organiser 026979 Pack of 1 Filofax Metropol A5 Black Zip Organiser. Modern, zip around organiser with a smooth leather look PU cover, 4 vertical credit card pockets, 2 vertical turned edge pockets with full length pocket behind and elasticated pen loop. Size - 148 x 210mm. 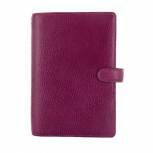 Filofax Finsbury A5 Raspberry Organiser 025371 Pack of 1 Filofax Finsbury A5 Organiser Raspberry 025371 Features credit card pockets, internal pocket and pen loop. Includes diary, ruler/page marker, name and address pages and a range of notes pages. NB. A-Z index not included.